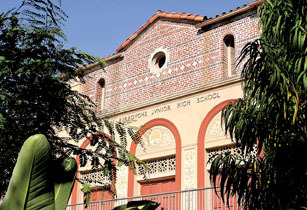 JOHN BURROUGHS Middle School first opened its doors in 1924 with 400 students and 23 teachers. In January of last year, residents met in the auditorium of John Burroughs Middle School to hear an overview of a multi-year modernization project for the school’s historic buildings and campus. One year on, the Chronicle contacted the Los Angeles Unified School District (LAUSD) and local stakeholders to find out where the project stands. “We have enjoyed a transparent and productive relationship with the LAUSD team,” says Joanne Medeiros, who serves as school committee chair for the Hancock Park Home Owners Association (HPHOA). Medeiros explains that she has been invited to attend meetings held on a regular basis to provide input from a residential perspective. Ehrlich Yanai Rhee Chaney Architechts (formerly Ehrlich Architects) was selected in response to a request for proposals (RFP), and the firm has started the design process, says Medeiros. Issues that are front and center, she explains, include traffic mitigation for McCadden Pl., alternative entrance solutions for the handicapped, building new classrooms and a cafeteria, and scheduling issues related to upgrading the historic buildings built in 1924. “Design solutions will be presented soon,” Medeiros says. Elvia Perez Cano, a spokesperson for LAUSD, confirmed the project remains in preliminary design concept development, and she notes that the consultants are also performing the necessary environmental reviews. A community meeting is planned soon, she adds. Not on Cano’s list is the Los Angeles Conservancy, who told the Chronicle that they have pressed LAUSD for more information with no luck. Burroughs is one of 11 campuses chosen to benefit from major improvements to their facilities through the LAUSD’s Comprehensive Modernization Project. Details on the next community meeting at John Burroughs should be made public in coming weeks. Watch this space.